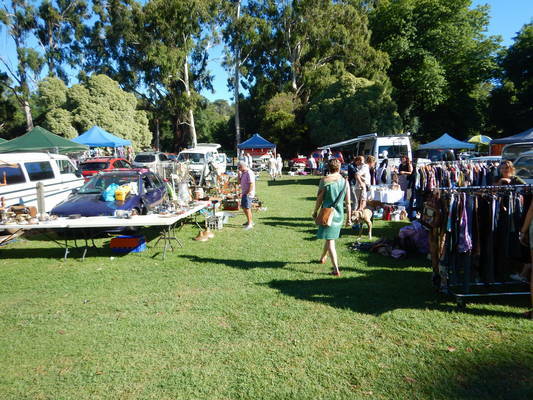 A busy Healesville Green on market day. New planning rules for Healesville are on their way to the Planning Minister for approval – and make it clear that the Healesville Green hasn’t been forgotten. Yarra Ranges Councillors agreed to adopt the Yarra Ranges Planning Scheme Amendment C163 Implementation – Part 1 Healesville Structure Plan at their Tuesday 9 April meeting, as well as sending it to Richard Wynne. It implements a number of actions identified in the Healesville Structure Plan, and proposes rezoning public land into zones that reflect current and future use. It also applies an Environmental Audit Overlay to two parcels of land. Councillor Fiona McAllister said the report made it clear that the council hadn’t given up on the grassed land parcel at 13 Green Street known as the Healesville Green. “Recent communication with VicTrack shows they have more important things to worry about than the future of Green Street,” she said. The Mail reported last July that the VicTrack-owned open space on the corner of River and Green streets would go on the market after the shire declined to buy it for $1.185 million. The council leased the land for many years, but the lease was terminated last year. VicTrack is seeking to have the land rezoned. “The steps VicTrack has taken to dispose of the land are acknowledged,” the planning scheme amendment report said. So the council resolved to “investigate options for a long term lease of the land or acquisition of the site”.